New findings published today in the Proceedings of the National Academy of Sciences of the United States of America (PNAS) by Desert Research Institute (DRI) Professor Joseph R. McConnell, Ph.D., and colleagues document a 192-year series of volcanic eruptions in Antarctica that coincided with accelerated deglaciation about 17,700 years ago. "Detailed chemical measurements in Antarctic ice cores show that massive, halogen-rich eruptions from the West Antarctic Mt. Takahe volcano coincided exactly with the onset of the most rapid, widespread climate change in the Southern Hemisphere during the end of the last ice age and the start of increasing global greenhouse gas concentrations," according to McConnell, who leads DRI's ultra-trace chemical ice core analytical laboratory. 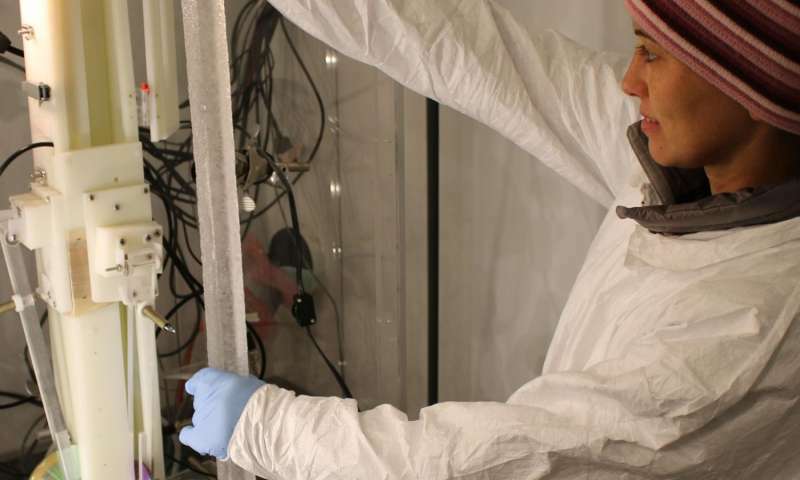 Monica Arienzo, Ph.D., an assistant research professor of hydrology at DRI, loads an 18,000-year-old sample of the WAIS Divide ice core for continuous chemical analysis using DRI's ultra-trace ice core analytical system in Reno, Nev. Credit: DRI Professor Joseph R. McConnell, Ph.D.
Additional analyses and modeling studies critical to support the authors' findings were made by collaborating institutions around the U.S. and world. 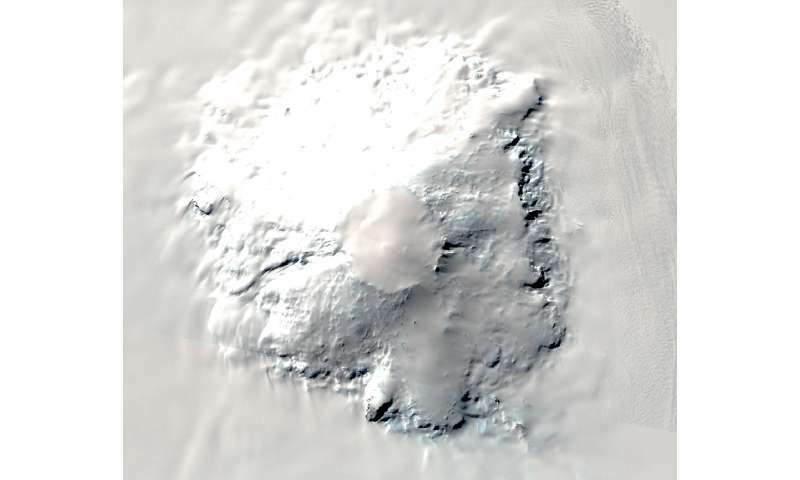 "These precise, high-resolution records illustrate that the chemical anomaly observed in the WAIS Divide ice core was the result of a series of eruptions of Mt. Takahe located 350 kilometers to the north," explained Monica Arienzo, Ph.D., an assistant research professor of hydrology at DRI who runs the mass spectrometers that enable measurement of these elements to as low as parts per quadrillion (the equivalent of 1 gram in 1,000,000,000,000,000 grams). "No other such long-lasting record was found in the 68,000-year WAIS Divide record," notes Michael Sigl, Ph.D., who first observed the anomaly during chemical analysis of the core. "Imagine the environmental, societal, and economic impacts if a series of modern explosive eruptions persisted for four or five generations in the lower latitudes or in the Northern Hemisphere where most of us live!" DRI's initial findings were confirmed by analysis of replicate samples from WAIS Divide, producing nearly identical results. "We also found the chemical anomaly in ice from two other Antarctic ice cores including archived samples from the Byrd Core available from the University of Copenhagen and ice from Taylor Glacier in the Antarctic Dry Valleys," said Nathan Chellman, a graduate student working in McConnell's laboratory. "The WAIS Divide ice core allows us to identify each of the past 30,000 years of snowfall in individual layers of ice, thus enabling detailed examination of conditions during deglaciation," said Paul Cutler, NSF Polar Programs' glaciology program manager. "The value of the WAIS Divide core as a high-resolution climate record is clear in these latest results and is another reward for the eight-year effort to obtain it." Wait, I was assured that rapid climate changed only occurred due to human meddling. More climate change from one medium sized erutpting volcano that from all of mankind's activities in a year. "Just about every mathematically literate person who has dug into the research thinks it is iffy as hell (with the notable exception of the BEST project that is being run by a physicist) and anyone who looks at the smug hypocrisy of most green campaigners quickly realizes they're in it mostly for the bansturbation"
Really? Where was it? Show me your source? Volcanos constitute 1% of human emissions. Personally, I completely love this denier argument. By arguing that volcano emissions can cause warming, deniers are actually accepting that CO2 increases are linked to rising temperatures. Once you realise that volcanic emissions are only 1% of human emissions, it's clear this argument is actually FOR AGW. So, thanks Shootist for agreeing that human-induced climate change is happening due to emissions. It's progress! "accepting that CO2 increases are linked to rising temperatures"
But this just isn't true, CO2 has risen 30% the past 100 years, temp hasn't thankfully. I can't wait for you to come back with that always-compelling "No it's not because they're LYING!" argument. That's super compelling especially with little to no evidence. Rejecting all the data because it disagrees with your preconceived ideas is not skepticism, it's anti-rationality. Global averages temperatures have increased just over 1 degree since 1880. That is a fact. And, yes, if you claim that volcanic emissions of CO2 can cause warming then you're accepted the physics behind AGW. Increase in CO2 = increase in temperature. You can't argue volcanos increase warming but CO2 doesn't. It's a contradiction. Whoever assured you of that was an idiot. And only an idiot would believe it. But wait YOU, an old time antigoracle/waterprophet sockpuppet, was assured only one thing on this site, and that is bananas for your ever so dumb,sensless,idiotic comments, do you still attend those dumbing down classes ? or have you reached the rock bottom of dumbness. Agreed, Electric cars is the future and polluting,messy,maintenence prone ICE stove stokers the past. Just more proof that natural, radical changes in climate are a normal event and that just because the kooks want to blame a supposed event (temps rising now) on man doesn't make it so. My grandparents all died of cancer they didn't get from smoking. This is proof that lung cancer can't be caused by smoking. That logic is airtight, right? Just more proof of an antigoracle sockpuppet thumping his chest not having a clue as to what climate change is and even less capacity to understand decades of scientific evidence. Volcanoes erupt more CO2 in the atmosphere . Volcanoes stop erupting CO2 reduces. Wow it all makes sense now. Volcanos emit approximately 1% of human emissions according to the USGS. Volcanos can only have short term regional impacts on climate, even with a massive eruption like this one. If you actually read this piece, their speculation is that the eruption coincided with other external factors and was still only regional. You did read it, didn't you? "The WAIS Divide ice core allows us to identify each of the past 30,000 years of snowfall in individual layers of ice, thus enabling detailed examination of conditions during deglaciation,"
Note that the STARTING 'trigger' ALSO involved a CONFLUENCE of consequent/concurrent events/processes involving Ozone layer depletion and changes to albedo/insolation etc....and Natural warming/deglaciation was over a period of 30, 000 years! Whereas WE, due to CO2-increases-related changes, NOW EXACERBATING the previously tolerable/safer warmer conditions and DESTABILIZING previously 'settled' wind/ocean/temp GLOBAL 'climate patterns' over mere DECADES! If you think about it, there has been so much of the additional heat/energy increase going to warm Ocean waters and being absorbed by land masses and dissociation/melting of methane and CO2 clathrates etc, that the 30% increase in CO2 has yet to fully work its way through the system to the point where most transitional 'heat sink' reservoirs/processes have 'exhausted' their 'buffering potential'. Of course warming isn't just about surface temps. Heat sinks have been buffering air temps but ocean temps etc still rising. So the energy is still in the system. When it comes down to it, this insistence on air temps is just another kind of cherry picking. It's about the energy that's in the system as a whole. See this in ice melt and weather anomalies. But even if you insist on air temps only, they've increased. So his statement is doubly wrong. Then there's latent heat of unfreezing and evaporation, which don't show up as temperature. Ice doesn't become water, and water doesn't become water vapor, by magic without any energy input.